I don’t know about you, but every year I have this dream in my head of what Christmas should look like. It should have all of my favorite traditions from when I was little (but without all of the hard work that I know my Mom put in behind the scenes), plus all sorts of Martha Stewart-esque touches. I expect a roaring fire and stockings hanging by the mantle. Hubby and I would be cuddled up under blankets all toasty warm and watch the snow drift gently down. The presents that I selected would not only be beautifully wrapped, they would each be exactly what the recipient had always dreamed of having. Carols would be sung, cocoa would be made, and Santa would like my cookies. It would all be perfect. So, what did Christmas really look like? Well, I didn’t plan far enough in advance, so I didn’t decorate the house at all. The chimney needs to be swept really bad, so a fire in there would probably burn the house down. We celebrated with my hubby’s side of the family early, so that part of Christmas was done by mid-month. The “perfectly wrapped presents” turned into “presents stuffed into gift bags”. My hubby had a vicious cold, so he was completely miserable the entire week of Christmas. We cuddled up under seperate blankets on opposite sides of the sofa. I did not want to be anyway near the germs he was spewing! The only thing that went according to plan is that we had snow. For a lot of people that wouldn’t be a big deal, but here in Texas it is pretty much a miracle to have a White Christmas. So, was this the worst Christmas ever? No, not by a long shot! It may not have been perfect, but I spent the day with the person I love most in the world. We both have good jobs, a roof over our heads, and plenty to eat. My friends and family are all healthy. My very old furry kids are all still going strong. Life is pretty darn good. Christmas might not have been perfect, but there is always next year! For everyone in the blogosphere, I hope that 2013 will be your most prosperous, adventurous, best year ever! So, we survived 12/21/12 and the world continues. 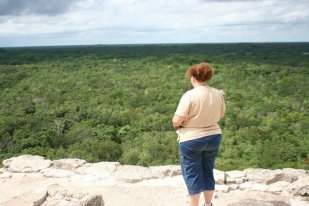 With the whole world talking about the Mayans yesterday it struck me that the perfect way to start this blog would be to tell you the story about how a Mayan pyramid changed my life. The story starts way back in my childhood. The minute that I first learned about the Mayans, I was completely and utterly fascinated. The very first thing that I ever put on my bucket list (before I even knew what a bucket list was) is that I wanted to stand on top of a Mayan pyramid. This fascination continued into my adulthood. Whenever local museums have had exhibits or guest lecturers talking about Mayans I have been the first in line to attend. Yes, I was rather obsessed. About a year and a half ago I was going thru a rough time. A job that I once loved was no longer satisfying. I was considering re-focusing my career in another direction. My whole life just felt stagnant, like I didn’t have anything to look forward to anymore. My sweet hubby was trying to think of something to help me and knew that an adventure was exactly what I needed. So, he proposed that we take a vacation to the Yucatan peninsula so that I could finally see the homeland of the Maya and experience the ruins in person. Then he took it one step further and found a site that still allows you to climb the pyramids. This was it! I was actually going to get my opportunity to fulfill my lifelong dream. Then, reality set in. I was fat, out of shape, and in my late forties. I was in no condition to try climbing a pyramid. Did I mention that I’m also afraid of heights? But, I decided that I would still try. Even if I got up a few steps I could still feel the stones and say that I had been on a pyramid, even if it wasn’t the top. When the day of the climb arrived I was beyond excited and scared stiff. I stood at the bottom of the pyramid and stared up in awe. It was huge! 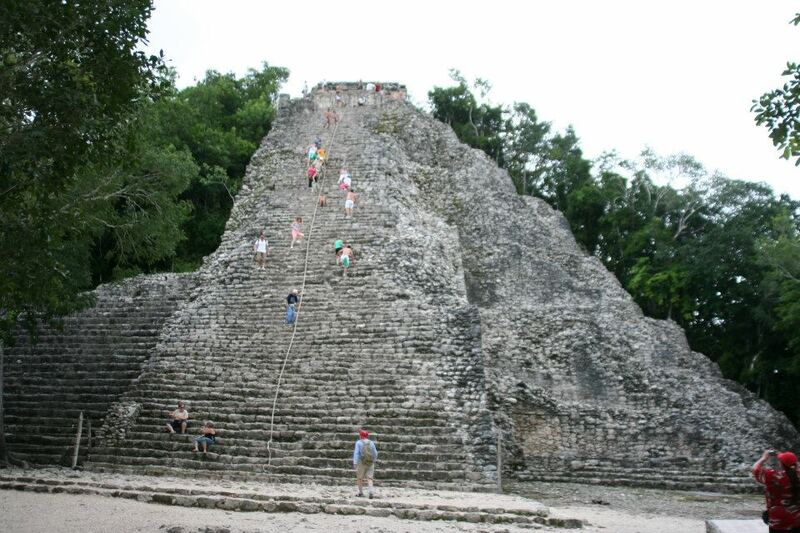 This was Nohuch Mul, the tallest pyramid on the Yucatan peninsula and second tallest in the entire Mayan world. I took the first step. That wasn’t so bad. I made a few more steps. It was steep and the steps were very crumbly. I climbed and climbed until I finally decided I had to take a break. I turned around and sat down on the steps. I was only about a quarter of the way up, but the view was already breathtaking. We had arrived early, so hubby and I were the only ones on the pyramid. We had such a perfect moment, sitting on this pyramid all alone. It was calm and serene, but I wanted to try to get a little higher. This is when things started to get more difficult. It seemed like every step got a little taller and a little steeper. By the time we were about halfway up I was really struggling. A tour bus had arrived and there were all these young and in-shape people that were just cruising up the steps like it was the escalator at the mall. By this time I had been reduced to crawling up the pyramid. I could only go a couple of steps at a time without having to stop and rest. Every sensible brain cell I had was screaming at me to stop. But there was this other voice in my head. That voice was telling me that this was a life-changing event and that I owed it to myself to give it my all. Of course, the best voice of all was my sweet hubby telling me that he believed in me, that he knew I could do this, that he wouldn’t let me fall. Then came that awful moment. The moment when I didn’t think I could do it anymore. The moment that I gave up. The moment that my hubby said he would finish the climb for me and take some pictures from the top so I could see it. I said there for a few minutes with sweat pouring down my face, huffing & puffing and trembling with exhaustion. I looked out over that incredible vista telling myself that I should be very proud that I made it this far. Then I looked over my shoulder to see the top and realized that it was only about a half dozen steps away. I had nothing left, there was no way I could do even that much. Then, from somewhere deep inside me I found this fierce determination that I would not give up. I climbed one more step. Then another step. It took awhile, but I was able to make the six most physically draining steps of my entire life. I stepped onto the top of Nohuch Mul and immediately burst into tears. I had done it! I had fulfilled a childhood dream, overcome my biggest physical challenge ever, and defeated the voices in my head that said I was too old & too fat. I looked out over this vista that seemed to go on forever and felt the whole world open up before me. Since that day I have looked at the world in a whole new way. I left the job that I no longer loved. I studied and became certified in my new career direction. I realized that I had a whole lot left to look forward to in life. Now, whenever I am facing something that scares me or seems too hard, I just say to myself “I climbed the pyramid”.